While looking to upgrade an old 7m, twin rotor rake for a wider 9m version, Devon farmer Nick Cordwent opted for a trailed, non-powered V-rake. Geoff Ashcroft reports. The 9.7m working width machine can gather up to four rows into one. 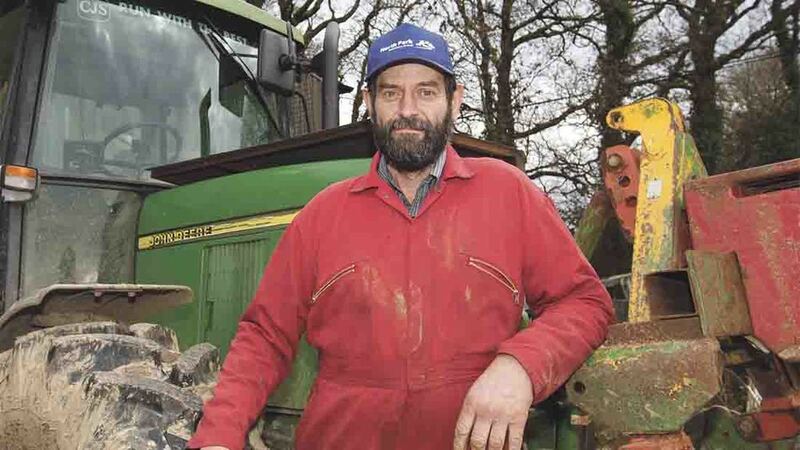 The search for a wider rake, offering a bit more output, led Devon farmer Nick Cordwent to consider the options available to him. Based at West Hillerton Farm, Spreyton, Devon, Mr Cordwent rears about 60-70 dairy replacements each season, which places demands on forage quality. For the task, he aims to produce high quality, round bale haylage, with baling carried out either by one of his neighbours or local contractor. Maintaining an element of control over forage production, Mr Cordwent carries out mowing and raking, which accounts for about 120ha (300 acres) of crop each year. “The Enorossi V-rake is cheaper to run and easier to use than a twin-rotor rake,” says Nick Cordwent. 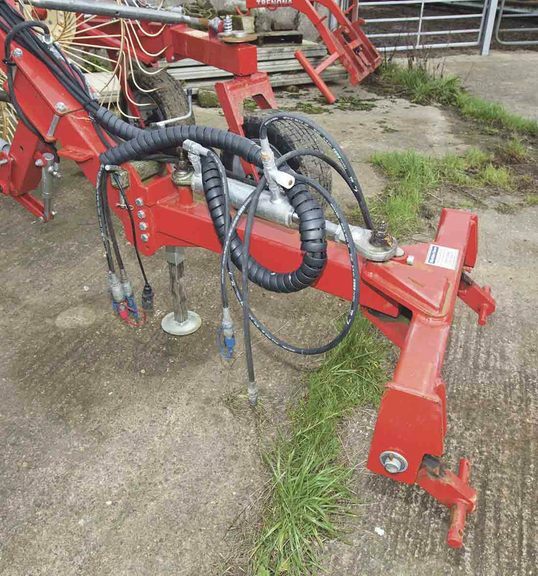 In addition to providing the wider working width he sought, the Enorossi rake offered mechanical simplicity, no pto, lower running costs and a much lower purchase price than the cost of a 9m twin rotor rake. 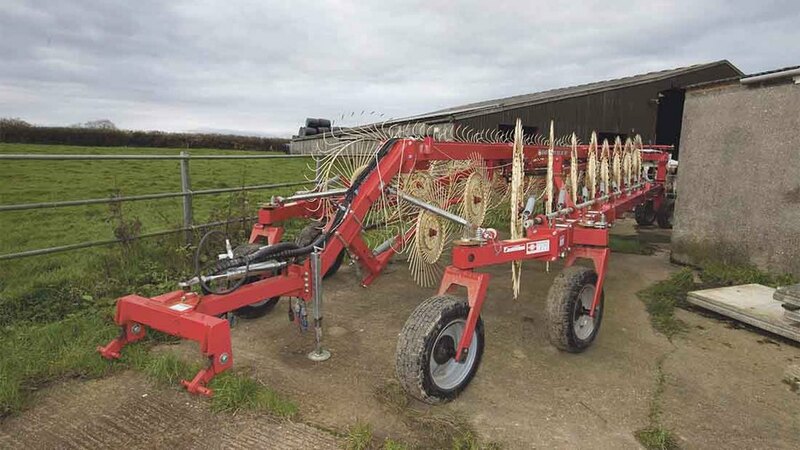 Enorossi V-rakes are imported by Exeter-based Agri Market Insight and Access (AMIA). The pull-type implement uses Acrobat-type finger wheels on a hydraulically adjustable frame, to gather crop into a central swath. Formats include four, six, eight and 12 wheel versions, offering working widths from 6.3-11.5m. Machine manoeuvrability is managed by a closed-circuit hydraulic steering system which links the headstock to the rear wheels – any movement at the headstock is translated into rear wheel steering. In addition to the finger wheels, an additional pair of raking wheels can be fitted to the front of the central main frame. Their purpose is to ensure all crop being raked, is moved, to avoid placing the collected swath on top of any unmoved material. In work, the rake runs on all its wheels – there are castor-type support wheels at the front of the V-frame, in addition to those at the rear. Raising and lowering the finger wheels is done hydraulically, using a sliding bar which holds tensioning springs acting on each finger wheel axle. Modifications to the closed circuit steering system allow the rear wheels to be steered using a spool valve. Increasing tension has the effect of lifting the fingers clear of the ground, while decreasing tension lowers the finger wheels. And the independently sprung nature of each finger wheel also affords ground contour following. For swath width adjustment, the last finger wheel on each side of the rake can be positioned in any of three locations. Releasing a locking pin allows the finger wheel axle to be withdrawn and repositioned to suit. While the V-rake is much lower than a twin-rotor rake when folded for transport, it is long. And the eight-wheel version used by Mr Cordwent measures 10.3m from front to back. With eight tine wheels on each side of the machine, the Easy Rake 16ST offers a 9.7m working width. 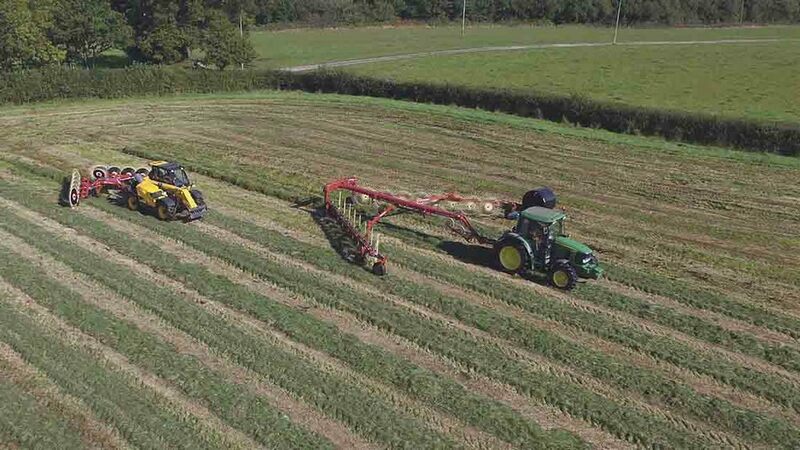 When it comes to raking quality, Mr Cordwent says the V-rake does a great job, and after three seasons use, he has had no complaints from those baling behind him. Used with a John Deere 6310, he says that no longer running the tractor at pto speeds when raking, now saves on fuel. He adds that the V-rake format offers in-field flexibility too, when negotiating poles or other obstacles. He points out that the length of the rake can leave a delta-shaped grass wedge at the end of each pass, which then requires a final run around the headland to collect any unraked grass at the end of rows.